I've only read this book once. I do agree that some books are better appreciated on further readings. My difficulty is deciding which books to re-read when there are so many books on my shelf waiting to be read the first time.. So far, American Gods hasn't made it to my "must re-read" list, but I'll admit I don't now remember why it didn't grab me at the time. Divers and Sundry - That's true. The only reason I reread the book was because I have no time to risk a boring book, I'd rather go back to those tried and tested. Jess - Exactly! 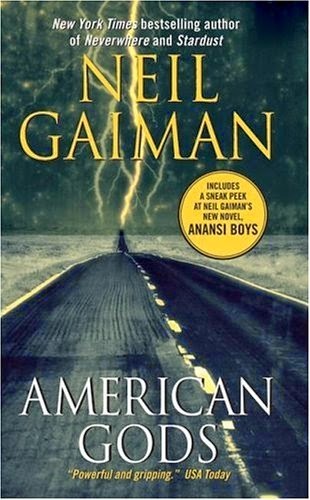 Anansi Boys is a lot smaller in scope than American Gods but it is also very same in the way he weaves stories together. Thanks for stopping by! I re-read American Gods fairly recently, and I agree with what you say. Definitely I had the same experience about America being a character, perhaps the most interesting character of all. I was also a bit disappointed, both times, and I think I re-read it to figure out why. Perhaps your explanation is better than the one I came up with (can´t remember exactly what it was now, but I did feel the book lacked true depth). At the end of it, it felt more like creamcake than a proper meal. I failed to see the urgency of the story that the premise suggested. It did put me off Gaiman, but perhaps I should try something else of him. What would you suggest? Where is he at his most subtle? Viktoria - I've been told Neverwhere is Gaiman's best writing, but I haven't read that. I would recommend The Ocean at the End of the Lane, which is subtle and charming. It's sort of an adult fairytale, and the best I have read of his. That being said, it has none of the mythology-cultural aspects of this and is more personal.